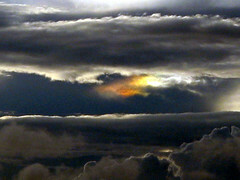 Seen on November 18 2006 around 5:30PM on the western horizon as the sun was setting. 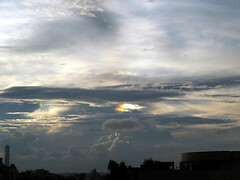 This is quite a rare event, though many people have reported seeing this kind of a cloud at many different occasions. 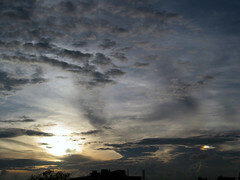 Reason for a rainbow being visible in a cloud has been given as oblique rays of the sun (58 degrees is the optimal angle) hitting a high altitude (cirrus) cloud which is mainly composed of ice crystals in such a way that the light bends through the cloud and refracts, giving rise to the rainbow phenomenon within it. A simple Google search will yield many such recorded evidences, some more beautiful than this one. 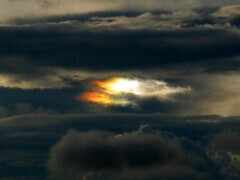 But, this is my first sighting of a rainbow cloud. Even I never heard about it until I read this article. But that evening was a pleasant surprise.